Birchdale, trained by Nicky Henderson, capitalised on Brewin'Upastorm's fall at the final flight to maintain his unbeaten record with a wide-margin success. It was a landmark 1,875th success for Barry Geraghty, who moved up to fourth on the list of most successful jockeys ever in Britain and Ireland. 6/4 favourite Brewin'Upastorm (Olly Murphy/Richard Johnson) led the five-strong field from the off and still held a narrow advantage when falling at the last, leaving Birchdale in front to come home 18 lengths clear of Buster Valentine (Ruth Jefferson/Leighton Aspell). Lambourn-based Nicky Henderson said: "You never like to see that and it was going to be a good race. I am sure that both jockeys will say that they would have won - you can take that for granted! "Birchdale is only a baby but is doing his job nicely. He is a talented youngster. The form of his Warwick win has worked out well but I thought that he was just a bit green throughout the race today - he was on and off it a little bit but jumped very well. "I was originally going to come here with Champ but there was no point as he didn't need another race. They are both really Ballymore horses and it was really sorting the pack out a little bit. "I do like this horse a lot but it was only the second hurdle race of his life, so he will have learned a lot today." 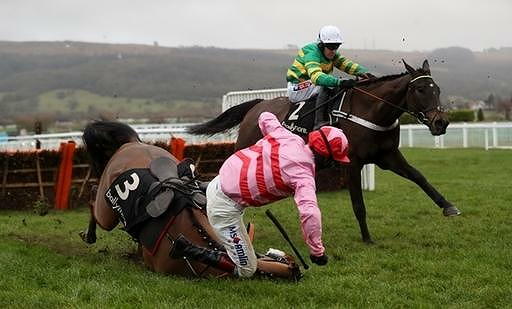 Barry Geraghty added: "We will never know who would have won, but I think there wouldn't have been a lot in it. "I was getting there on a baby, who lacked experience, but I was getting there. I was happy enough and coming with a good challenge, but it was simplified anyway. "It was only his second racecourse run, but he did everything you would like through the race. Dickie (Richard Johnson) brought a good gallop and was finding us out - we knew that we were in a good battle and we were going to have to work hard to beat him. "Birchdale hasn't the experience compared to Champ and would have learned a lot today. He is a little baby but you have to love him." The two and a half-mile £32,000 Ballymore Classic Novices' Hurdle has been won since the turn of century by subsequent Festival winners Monsignor, Iris’s Gift, Wichita Lineman, Bobs Worth and At Fishers Cross.